Designed by Elmar Roush the Cimbri Axe is inspired by traditional Frankish throwing axes with a more contemporary function in mind: wood craft. 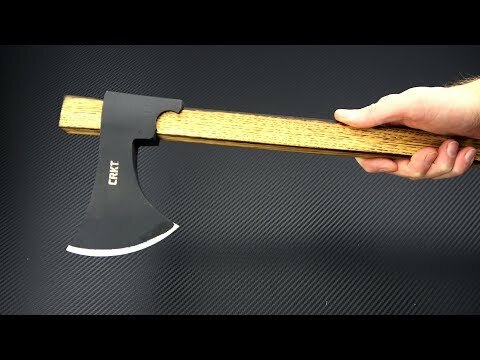 The axe takes its name from a Germanic tribe who used a similar axe in battle. The Cimbri takes inspiration from this design in the head but is made more robust and with a longer handle for two-handed axe work like limbing and felling. A carbon steel head and Hickory handle are classic elements of this chopping tool and proven in the field. Part of the Forged By War series, which employs combat veterans as designers, 10% of the CRKT net profits are donated to the veterans' charity of choice. Head: Made from Hot Forged 1055 Carbon Tool Steel with a passivization treatment of Black Magnesium Phosphate Coating for enhanced corrosion resistance. The beard of the ax extends the effective cutting edge increasing the efficiency while remaining nimble and accurate. An extension of the eye down the handle adds durability to the head and increases the mass for added power in two-handed swings. The ancient war-ax design has been re-imagined as a highly effective woods tool. Handle: The Cimbri has a finely crafted, flame finished Tennessee Hickory Handle in a functional tapered rectangular shape that allows for a sold grip for chopping and smooth flight when throwing. Simple, durable and perfectly suited for this Germanic design the handle is just over two feet long to facilitate two-handed use.